The Cloud Roads is the first book in the Books of Raksura series by Martha Wells, author of the Nebula nominated novel The Death of the Necromancer. The second volume, The Serpent Sea, is scheduled for release in January 2012. Thanks to a brief Twitter conversation with Martha Wells, I discovered that she is working a third book even though it hasn’t been purchased by the publisher yet. When Moon was very young, his mother and siblings were killed, leaving him all alone. Since then, he’s never met anyone else like him: Moon has two forms, one with wings and one without. He’s lived among various groundling communities, but he’s never really found a place to belong. Even if he manages to be friendly with others, he still always has to hide what he truly is. If the groundlings see his winged form, they confuse him with the bloodthirsty Fell and no longer want anything to do with him. Over the years Moon has learned the hard way how to best blend in with the other groundlings, by doing things such as always accepting food and hunting away from the others. For a time, he’s been living with the Cordans where he lives in a tent with two women, one of which he has formed a relationship with. However, one night his lover follows him and sees his other form without his knowledge. She sneaks some poison that only works on Fell into his tea. When it has an effect on him, the Cordans leave him to die. Fortunately, Moon is rescued by Stone, a shapeshifter just like him who has been scouting for others like them. He informs Moon that he is part of a race known as the Raksura and offers him a place with his court. Moon accepts, but he doesn’t know the dire straits the Raksura of Indigo Cloud Court are in, nor does he realize just how important he may be to them. As the Raksura are simultaneously fighting threats from both within and without, Moon undergoes a more personal battle: whether or not he can truly find a place to belong with the other Raksura. 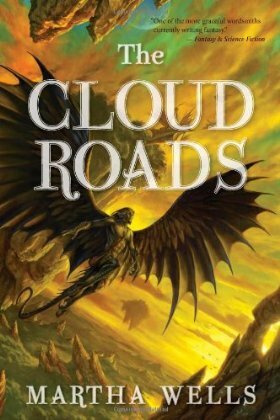 The Cloud Roads is a book that does what a good fantasy book should do – transports one to a completely unique world but adds plenty to relate to through its characters and themes. It is a rather simple story, and the line between the good side and the evil side is drawn more clearly than I normally like. In spite of that, it really appeals to the part of me that does want to see justice and goodness prevail. That’s largely because it does have a main character in a position the average person can easily empathize with – someone who has tried all his life to fit in and failed, someone who just wants a place to belong. Moon’s inability to find these most basic social needs made it easy to want to see him succeed. From the very first chapter, I was on Moon’s side and wanted him to find happiness. It was so sad that he didn’t know where he came from and had to learn how to hide who he was from others to just not be shunned. Even so, he was still always different and it was so unjust that these other races were so prejudiced against that. When he lived with the Cordans, he helped them gather food for the group and never hurt anyone. Yet the moment one of them learned he was different, fear took over and they wanted him eliminated. It was just that easy – one chapter about Moon’s situation ending with him in peril and I was hooked. Soon Moon learned more about who he was and it was a novel about discovery, identity, learning to trust, and forming relationships in addition to the adventure of going up against the Fell. Aside from the more character-focused themes, the major plot is about the Fell threat and how to counter it. The Fell are a winged race who are rightly feared by all other races – and Moon and some other Raksura are often confused for them, which is a big reason Moon has to hide his winged form. On the way home to the Indigo Cloud Court, Stone brings Moon to another colony only to find the Fell have destroyed it. When they arrive at Stone’s home, they find the Fell have visited them as well and are suspicious of their queen for speaking with them. The Fell are very evil, and this is why the two sides seem so black and white. While they have a justifiable motivation for their behavior toward the Raksura, they are still very despicable in general and do not seem to have any good qualities. Since there will be at least one more book, I’m hoping they will gain more dimension later. If not, I still don’t think it’s a bad thing given the context of this novel and the way it makes one want to see what’s right prevail. It also helps that the Fell are not human so it may not be necessary to attribute human qualities to them, although the other characters we are introduced to do seem more dimensional than the Fell. While many elements aren’t particularly complex – the villains, the writing, and the plot – this novel does have an intricate world comprised of many different races. It’s known as the Three Worlds for the realms of the sea, the earth, and the sky and it’s populated by a variety of intelligent species. This novel mostly delves into the Raksura as learned through Moon’s eyes for the first time, but there are hints of other things that will hopefully be talked about more later (like the relations between the Fell and the Raksura and the sky creatures I assume inhabited the mysterious floating islands). The Raksura are a rather interesting race with a very defined social structure based purely on biology – when a new Raksura is born, it’s obvious what role he or she will have based on its appearance and its shapeshifting forms. This includes everything from soldiers to queens and their male consorts. It’s not all clearly defined, though – such as the details of the queen/consort relationship, which is another significant part of this novel. In general, I thought a lot of the simplicity worked for this novel, but there were some times I thought potential conflicts were resolved too easily. At times, suspicion could be cast on a member of the group with good reason and it was often very quickly dismissed as a non-issue. Although I didn’t want to see Moon treated with distrust, I did think it would have made sense for him to be greeted with more of it than he was as an unknown Raksura. Also, while the characters were likable and had very sympathetic qualities, I didn’t feel that any of them had a lot of depth, even Moon. He was in interesting situations with his position with the new Raksura and he had problems that were easy to relate to, but he didn’t have a lot of distinct personality. The Cloud Roads was an engaging, absorbing novel. In a lot of cases, this kind of simplicity doesn’t work, but this is a case where it does. The rich world works to counterbalance the lack of complexity in writing, plot, and characters. Furthermore, it’s just a good story that tugs on the heartstrings. Once in a while it’s refreshing to read a book with a clear good side and a well-meaning main character to root for, and The Cloud Roads is one example of a book that both does this concept very well and adds some originality with the world-building.